FILE - A group of Army recruiters salute during the playing of the national anthem at the change of command ceremony for the Jackson, Mississippi, Army Recruiting Company of the U.S. Army Recruiting Baton Rouge Battalion, March 12, 2014. They have raised their right hands, and sworn an oath to support and defend the U.S. Constitution. They have college degrees, and have enlisted in the U.S. Army. They have also fallen out of their immigration status, exposing them to deportation. "I did everything I could to stay with valid status," A.M., an Army reservist, told VOA. A.M., 35 years old, who asked not to be identified because she is afraid of deportation, enlisted in the Army in March 2016 under the Military Accessions Vital to the National Interest program, or MAVNI. MAVNI was launched in 2009 to bring immigrants with medical or language skills into the armed services. The program also allowed foreign-born military recruits to earn a fast-track path to American citizenship. But nearly two years after enlisting, A.M. is still waiting to ship out to basic training and her student visa has expired. A.M., who asked not to be identified because she is afraid of deportation, enlisted in the Army in March 2015 under the Military Accessions Vital to the National Interest program or MAVNI. The reason: The Pentagon, citing national security concerns, ordered intensive background checks on MAVNI service members and recruits. In September 2016, the U.S. government retroactively required background checks on anyone who enlisted in the military through the MAVNI program, including anyone who was currently serving or waiting to be shipped to basic training. The government also stopped recruiting legal aliens. October 2016 was when A.M. was scheduled to leave for basic training. A.M. was told she had to maintain her visa status until a shipping date. She did. But her first shipping date was canceled. Her second shipping date, April 2017, has come and gone — and she has fallen out of status. Without basic training, A.M.'s expedited naturalization process does not move forward. "Ever since I raised my hand, I go to every single drill," A.M. said. VOA spoke to seven people who have enlisted as active and reserve Army members and have also fallen out of status. All have signed enlistment contracts, have gone through the necessary background checks and have been waiting for more than two years to ship out. Everyone who wants to serve in the military has to go through background checks. "They check to make sure you are not a criminal or a terrorist. They check your credit records. They run your fingerprints. They ask you a whole bunch of questions. That's required before you can sign an enlistment contract," Margaret Stock, a retired Army lieutenant colonel who created the MAVNI program back in 2008, told VOA. With the MAVNI'S, she said, the government expanded the background check. "I should tell you they already were doing a lot more background checking on the MAVNIs anyway. They are the most checked group of people that entered the U.S. military," Stock said. The MAVNIs, in addition to the regular screening, were being individually approved by the Department of Homeland Security. "DHS was approving every single one of the enlistments individually. After checking all their immigration documents. … They were also doing something on the MAVNIs called a single scope background investigation, which is not done on most U.S. citizens who join the military," Stock said. This is an investigation normally done on someone getting top-secret clearance with the U.S. government. 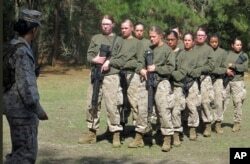 FILE - Female recruits stand at the Marine Corps Training Depot on Parris Island, South Carolina, Feb. 21, 2013. These additional checks were being done before September 2016, when the Pentagon decided to run counterintelligence screening on each MAVNI. "Basically, this caused the system to collapse. Because the government doesn't have enough resources to do all these types of background checks on 10,000 people [the number accepted to MAVN]," Stock said. The Department of Defense estimates it has a clearance backlog of 700,000, a figure that also includes civilians and contractors. The backlog is causing "extreme" delays in shipping people to basic training. MAVNIs are not allowed to go to training until they have gone through these checks. "But they didn't have the resources to do them. So it caused two years, three years delays in people being shipped to training. And as of today, they still haven't completed the background checks on everybody," Stock said. Without completed background checks, MAVNIs cannot ship to basic training. 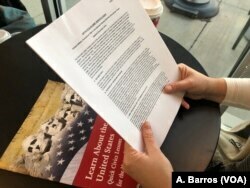 Without basic training, they do not qualify for expedited U.S. naturalization. In mid-October, Secretary of Defense Jim Mattis told reporters that an assessment of MAVNI found the program had problems. "We are taking the steps, obviously, to save the program if it can be saved, and I believe it can," he said. Within days, the U.S. Department of Defense toughened the requirements for expedited naturalization, requiring enlistees to serve at "least 180 consecutive days of active-duty service, or at least one year of satisfactory service in the selected reserve." This is a change from the current practice, where a service member would qualify for "expedited naturalization" after one day of service. Stock says there are legal reasons why the one-day policy was the original choice. "They deploy overseas a lot. Sometimes they might go to their own original country and, if they're not American citizens, they would be subjected to that country's laws," she said. And naturalization could always be taken away. "If you don't serve honorably for five years, you can lose your citizenship. … That's a trade-off. They can let you have it right away, but you can lose it," Stock said. A.M. moved to the U.S. in 2005 with a J-1 visa to work as an au pair. After that, she got a sponsor, attended college and changed to an F-1 student visa. "I saw as an opportunity to start a life here, to study, and from there maybe other doors would open for me to stay here," A.M. said. In Brazil, her home country, A.M. had a bachelor's degree in translation. In the U.S., she earned an associate's degree in early childhood education. "Once I graduated, I started to teach. … I had my own classroom. The kids, they were wonderful, and working with parents, it was a great job," she said. She was eligible to work in the U.S. under Optional Practical Training, temporary employment that is directly related to an F-1 student's major area of study. During that time, she worked on getting a sponsor for a longer-term work visa. "I taught [for] about 10 months because I was trying to get a work visa, but the school I was working did not want to sponsor anybody," she said. To avoid falling out of status, A.M. went back to school. This time she worked on a master’s degree in Teaching English as a Second Language in a Virginia university. A.M. heard about MAVNI in 2015. "After I enlisted, I had to keep my student visa so I went back to school once again," she said. A.M says all together, she spent about $50,000 in American schools to keep her student visa valid. There were times, she said, things were "so difficult that I was eating food from the dollar store, so that I could pay for college and could stay here. "I am so close, though. But at the same time, I am so tired because my life is on hold," she said. "At this point I was supposed to be a citizen already. I never thought it would take this long, and all the stress we're going through." A.M.'s biggest worry is her enlistment contract being terminated since she has yet to go to basic training. The Washington Post reported in September that U.S. Army recruiters had "abruptly canceled enlistment contracts for hundreds of foreign-born military recruits." "I'm a very independent person here," she said. "I see so much violence in my home country, so much injustice. ... My life is here." VOA reached out to the U.S. Department of Defense, but the department did not respond to a request for comment.